If we wish to go back to the very beginning, to the very first moments of creation, when all that we know was but a gleam in the eye (I) of the infinite, we must be somewhat simple-minded, rather than sophisticated. Though scientists have always wanted to find the root causes of what we see today, Modern Science tends to start from the present state of things and from the current level of complexity. To see those roots for what they are, we may need to adopt a rather different viewpoint from the mainstream, one that begins with the simplest abstract assumptions, and builds toward current levels of complexity and present-day conditions. It seems that Modern Science is still working up to the Ancient philosophers' ideal of starting with nothing and building from first principles. As they try to unravel the very beginning of the universe, however, today's scientists are learning profound truths that can be won only from the heart of simplicity. The Hubble Telescope and other space-based instruments are allowing us to peer further and further back, and more answers are becoming clear every day. There is a certain poetic justice in what's coming to light, however. Along with the revolution in Observational Cosmology and Theoretical Physics, we are seeing a re-emergence of ancient knowledge and the two appear almost as one. Some of the most ancient teachings that have been kept secret for a long time are now coming to the fore. This knowledge, and the evidence from ancient artifacts, appears to hold answers for the scientists of today. Of course, it can be argued that String Theory isn't like anything we have clear evidence of from ancient times. However, when we look to know the roots of String Theory, and to examine the most primal state of reality, there is another story. You see, some of the simplest geometric figures represent profound realities of the early universe. The first forms to appear created a template to build upon and forces that shaped the evolution of all form which followed–even the most complex forms known. One figure we see in ancient sites all over the world is the circle, and almost as frequently we find the circle with a dot in the center. These two figures are said to be symbols for God, Spirit, the Goddess, the Origin, the One Being, the Divine, the Original Self, the Eternal Tao, the Unity of All, the Great Void, or a symbol for nothing. It is rather ironic, that with so many lofty meanings, the one meaning we see most often is that the circle represents nothing, or Zero. Most people don't even think of zero as lofty, because they don't appreciate its role as a placekeeper in the system of numbers and in the process of counting. This subtle concept is quite profound, in fact it is basic to understanding some things, and it's often easily missed. Many people have learned to count starting with one. But for the counting of anything to be meaningful, we must understand that any count actually starts with zero. If we make it clear that the distinction between none and one of something is important, the rest falls into place somewhat automatically any time we have more than one. This is not to say that Number Theory and the process of enumeration is unimportant; on the contrary, that is what this article is all about. The question of how numbers became possible to enumerate is one of the great existential riddles of all time, though few have pondered this. Where did numbers begin, and how did counting first develop? Unraveling this mystery may actually help us to unlock the riddle of how the universe and time began, and provide insights into various other areas of inquiry, such as the evolution of life and consciousness. As with any number of other things, though, our understanding of counting proceeds from, or relates to, another topic of study. So, to get there we must talk about the subject of Cosmology, delving into the very origin of the universe, and go back to basics. You see, the first few steps in the process of unfolding the dimensions of reality, and the birth of the universe we live in, take place in a world very different from our own. Until recently, the best picture Science has been able to give is that the universe grew from an infinitesimal point in space. Scientists' equations showed only a Mathematical singularity, a place where the normal laws of Physics are suspended. They reasoned that this somehow gave rise to the Big Bang, or an Inflationary period (stretching out the universe), during which the unified force was fractionated into the fundamental forces (gravitational, electromagnetic, weak-nuclear, and strong-nuclear) through a process known as Symmetry Breaking. Scientists believe there was once a single force, a unified force which was the source of all else, after seeing that most of the forces appear as one at higher energies. They think there was but one force and a perfect symmetry before the Big Bang, and that each of the fundamental forces assumed an independent identity, and a distinct character, as the universe expanded and cooled. This is seen to go hand in hand with a process which allowed for more and more complex form to arise in the universe, once the temperature was cool enough for the constituent forms to congeal somewhat. Before the current Cosmological Era, the universe was still too hot for atoms to endure long enough to form molecules. In the present-day local universe, there is a great proliferation of form to consider and appreciate. There are wonders upon wonders to behold, as one moves up the levels of scale, from the world of the exceedingly small (including quarks and sub-atomic particles), to the level of the extremely small (atomic nuclei, atoms, molecules), into the level of scale which is our common experience of the world, and beyond to the scale of planets, solar systems, galaxies, and galactic clusters. We move about, feeling as though we are but one form, distinct and separate from the rest of reality–but is this what's real? Our bodies are a collection of forms, and they remain connected with the body of the world that birthed us, and with the universe of which we are a part. Our bodies are comprised of both matter and energy, and our consciousness is a product of light and energy. For anyone or anything to be entirely separate isn't possible! This condition is the one similarity the present-day universe has to the world of the first beginning. By comparison, that reality seems rather boring or somewhat foreboding, even frightening, as it is featureless and almost bleak. It is devoid of form, but it has some quite magical properties which are the very source of light, life, and understanding. What happened at the time of the first beginning has been a subject of great interest to many people, from the dawn of historical time and probably long before. It has become clear to some of the best theoretical minds of today that a key to understanding this subject, and seeing how reality came into being, can be found by re-examining the zero-point itself. What they have discovered in the zero-dimensional world, instead of just a point, is something called a Zero-Brane, or membrane of zero dimensions. It has been found to have a unique Mathematics displaying non-commutative geometry. Non-commutativity means that if you move or turn in the zero-brane universe, you end up in exactly the same space you left. That is, you have total connectivity and total freedom of movement, as long as you don't exceed the "threshold of measurability". This is where things become interesting, because the fundamentals of Geometry arise from the process of observation and determination, which we later call measurement. The catch is, to be able to measure, one must first have the ability to count, and it appears that the potential to do this arises from taking the steps required to establish a coherent geometry, starting from a non-dimensional place, and building through form into dimensionality. This possibility does not appear to exist in the zero-brane world, but there is a way such a possibility could emerge. So where do we start, if we want to understand this? Let's go back to the very beginning, and trace the steps which arise in the process. In the beginning, there was no form whatsoever. There were no phenomena, no entities, and no distinctions. It wasn't even possible to make a distinction, because there was nothing to distinguish, and no one to do the distinguishing. Everything we know had yet to arise, and there was nothing to make anything out of. All was undefined (non-specific), and there was no observer to make a determination, or a definition, anyway, but the very ambiguity of it made it almost pregnant with possibilities. It's important to see that this is somewhat different from our concept of empty space, as a cold and lifeless place. The origin is devoid of form, but it is neither cold nor hot, empty nor full, dark nor light, and neither living nor non-living. In other words, it is totally ambiguous. On the other hand, a space where everything is lukewarm, and nothing can be clearly delineated, does not appear to give rise to distinct possibilities. So, if nothing is possible in the beginning, where does anything actually come from, or why does it come into being? I've come to believe that all form arises from the awakening of the One Being, and its attempts to know Itself. This creates something powerful that wasn't there before; or, to be more accurate, it creates someone powerful who wasn't there before–an observer. The significance of this point can hardly be overstated. Quantum Mechanics places great importance on the role of the observer, and notes the tendency for observation to influence the outcome of events while they are being measured. In fact, we know that it is nearly impossible to observe anything on the sub-atomic level without our measurements influencing the way things happen and what outcomes materialize. The process of observation has consequences, and there is no reason to assume that things would be otherwise before the birth of the universe. Also, it can be argued that all Geometry arises from observation and determination. Determination can become measurement, but only after a series of steps has unfolded and the possibility for enumeration, or counting, has emerged. You see, the idea of numbering itself, and the concept of proportionality must arise from some basis, a basis in form (or formation). Likewise, the universe and our entire reality have to have a dimensional basis, a stage for the play of Life to happen on. This is why certain aspects of geometry are considered fundamental, or sacred. The idea that the explorations of the One Being are ultimately the source of ALL geometry, and thus form a basis for what is real, is called Sacred Geometry. Having once been a focus of the Ancients, this study is once more receiving serious attention. Sacred Geometry is an ancient study that has been re-discovered, and it may help us understand where the universe came from–the very first beginning. Whether we are talking about the origin of the universe, the origin of consciousness, or the origin of abstract thought, we mean the same place. Any attempt to study or define it is likely to contain some of the same lessons. For the first time, however, we appear to be on the verge of truly understanding it. What seems to be happening now is a convergence of the depths of Philosophy, the heights of the Spiritual experience, and the culmination of a process first undertaken by Science and Mathematics centuries ago. Some things, you see, are really universal. The idea that the basis for all things can be said to spring from simple forms and build to levels of complex variability is a part of both Modern Science and Sacred Geometry, and it is an important point to remember. Although the origin of all is something difficult to comprehend, it really is simple after all. Nonetheless, the steps needed to create a universe of form beginning from nothing at all, are quite a potent mystery. We have almost as many descriptions of the birth of the universe as there are different people, or unique beliefs and disciplines, but most are rather fanciful. People have created quite a variety of distinct Cosmologies, or descriptions of the origin. Science appears to be on the verge of breaking through the barriers to understanding this subject in a definitive way, however, and the new understanding verifies some very ancient wisdom. There's a clear connection between certain concepts and assumptions of Sacred Geometry–as presented by Drunvalo Melchizedek–and those used by scientists to explain the origin of our universe. The idea that the basis for all things arises from simple forms is clearly the pivotal point. Just how simple form had to be at the beginning, has not been fully appreciated, however. With the complex and detail-filled world we live in, it's not an easy thing to imagine the formless state that gave rise to our universe, at all. This is complicated by our knowledge that there are unseen dimensions beyond the physical, because the origin is truly a dimensionless space. We could say that the number of dimensions is undefined in the absence of form, or before the first moment we can clearly make a distinction between spaces. Only when we observe our surroundings, or when we attempt to make determinations and measurements of discernible qualities, can any particular order of dimensions be distinguished from another. There's no way to discern a difference between a 2-d and a 3-d space, for instance, unless some manner of form which can be observed also exists there. That is, form is seen to define space by creating observable distinctions or surfaces. The sense of interiority and exteriority (which any curve exhibits) is a fundamental aspect of how space is defined. The quality of occupying space (possessed by objects) is an extension of the same principle. Form proceeds from possibilities, but it also engenders a range of new possibilities. The first emergence of form influenced what came after. Thus, the magic of zero was in everything which followed, but it remained deeply hidden as new qualities emerged and took the fore. The precursors of form became the constituents of the form we inhabit (ourselves and the universe), and the forces of nature as we now know them. In order to get to the current state, however, a number of dimensions needed to evolve in the process. Modern Science informs us that there must be several Hidden Dimensions to explain all of the objects and phenomena we can clearly observe. Physicists suggest that a 10 or 11-dimensional space-time geometry is required for some things we observe to be described. They wish to discover a single unifying description which applies to all of the fundamental forces, and it is believed that understanding dimensionality will allow us to do this. Electromagnetism and the nuclear forces have been relatively easy to unify for scientists. Gravity seems to be the most difficult force to account for, despite its familiarity, but there is new hope for Science to find a unifying theory. There is a wealth of new input from recent Astronomical observations and experiments, and there has been quite an explosion of theoretical developments as well. A revolution is taking place, in several areas of Science, as a result. The difficult part seems to be that a change in mindset (or viewpoint) is necessary for the new Science to emerge, or for it to really make sense. This situation is brought about by the apparently irreconcilable differences between the understanding of the universe we have gained with the Theory of Relativity, and what we have learned from Quantum Mechanics. This issue centers on the fact that Relativity can easily explain things happening on a very large scale, where Quantum Mechanics allows us to explain the world of the exceedingly small with great precision. Neither theory explains both. This leaves scientists on shaky ground, when they try to explain everything at once. There are several candidate "Theories of Everything" which attempt to knot all of the natural forces together, but no one theory seems to satisfy everyone, and some important pieces of the puzzle are still missing. Nonetheless, it is anticipated that the answer will be an outgrowth of something known as String Theory. Unfortunately, scientists haven't yet been able to pin down their target. They have yet to propound a precise formulation for the equations of this theory, despite a lot of mathematical wizardry, but once certain pieces are clearly understood, it is believed that the rest will fall into place fairly readily. In his book "The Elegant Universe," physicist Brian Greene suggests that what string theory still needs is its 'principle of inevitability,' that which makes it necessary to arise or inevitable that it should have the form it does, but it may be that this was understood ages ago, and I have seen some evidence of this myself. The figure known as the Flower of Life, which was found inscribed on one of the most ancient temples in Egypt, the Temple of the Osirion at Abydos, might just hold the answer to Modern Science's questions of why and how this theory (and perhaps all of Mathematics) arises. It is the figure representing the culmination of a process, the creation of the universal template, and it describes the unfolding of all form through the principles of Sacred Geometry. I expressed a fair amount of disbelief about such claims when I first encountered this figure, but I realized that it was significant, and I wondered what part it could play in the scheme of things–that is, how it would contribute to my overall understanding of the universe. I had already found a geometric figure (the Mandelbrot Set) that appeared to be the template by which the universe was created, and I didn't think I needed another. Nor did I think that there was any connection between the Flower of Life and either the Zero-Brane or the Mandelbrot Set. But I have discovered there is, and it's quite a profound connection indeed. To see this connection, we need to get a good understanding of the Flower of Life. If we are to create the Flower we must first evolve the Seed, and to obtain that Seed we must go back to the most primal of all figures, the Circle. Actually, we must go back to before the circle was realized, and work our way toward a full set of dimensions. Along the way, we will learn how to count, or rather, we will learn how (..the emerging consciousness of) the One began counting, for this is truly the One Being's story of Self-Discovery. It all begins with observation, the opening of the I (the "Eye of the One"), and an arc of observation spanning what is observed. In the featureless expanse of the zero-dimensional universe there is no barrier to observation, but nothing to observe and therefore no basis for comparison or measurement. Ergo, a circle standing by itself has no particular size, or extent. Thus, it is seen that in the beginning we can have a complete arc of observation with no particular extent. It could be a point, or it could be an infinite expanse, but this figure can also be described as a Circle of radius One. There were no other numbers yet and "one" represents the first boundary between zero and infinity. As we might imagine, this most ancient symbol for God, the circle, is found to be every bit as significant as it was once believed to be. Whether ordinary people in ancient times had knowledge of the deeper significance remains an open question, but we do know that Geometry was regarded as a sacred art form, and that at least a handful of individuals went much farther than just drawing circles. Still, the idea of a figure with a consistent radius, all the way around, is significant, and it may symbolize more than it can depict. A sphere is also a circular figure, and higher-dimensional forms can have a similar shape too. Circles are a meaningful abstraction, and they are a powerful building block. The range of forms which can be evolved through a combination of simple arcs and extents is virtually endless, and it seems that these simple forms really do serve as a template for all of the form which follows. Thus, following the route that leads from simple figures like the circle, to more complex form, might give us insight into the nature of process. Still, it would seem that the part which is most poorly understood is the very beginning, and that is simplicity itself. Going on from the point of origin, one might get the idea of moving to the perimeter of the circle (the observational horizon) and looking around again. Sacred Geometry suggests that this is exactly what happened next. We have one extent, one step taken by the One, and one more arc of observation, at this point. The form we can describe is the line connecting the points, the circular arc about each point, and the Vesica Piscis (fish-like shape), where the two circles overlap [see Figure 1]. If we generalize this process of moving to the periphery, and then observing another continuous arc, we form a ring of circles about the original circle, and create a figure known as the Seed of Life [Figure 2]. This is very significant, because it is at this stage that the One begins to develop a sense of proportion through an additive process which yields a knowledge of multiplicity. It also is when the continuity, or completeness, of the circle is verifiably realized, for the first time. This concept of verifiability is utterly important to understanding the significance of this process. What we are looking at is a situation where, in the beginning, the One Being had no frame of reference whatsoever (being aware only that it was conscious) and It needed to evolve one before the remainder of form could come into existence. The question remains of why this is relevant to the state of the universe today. What I suggest is that the explorations of the One (or the awakening and development of consciousness) actually resulted in the geometry of dimensionality itself, and that unseen dimensions existing before the advent of form as we know it, created our reality. Science knows some of this story, but there are further answers found in Sacred Geometry. 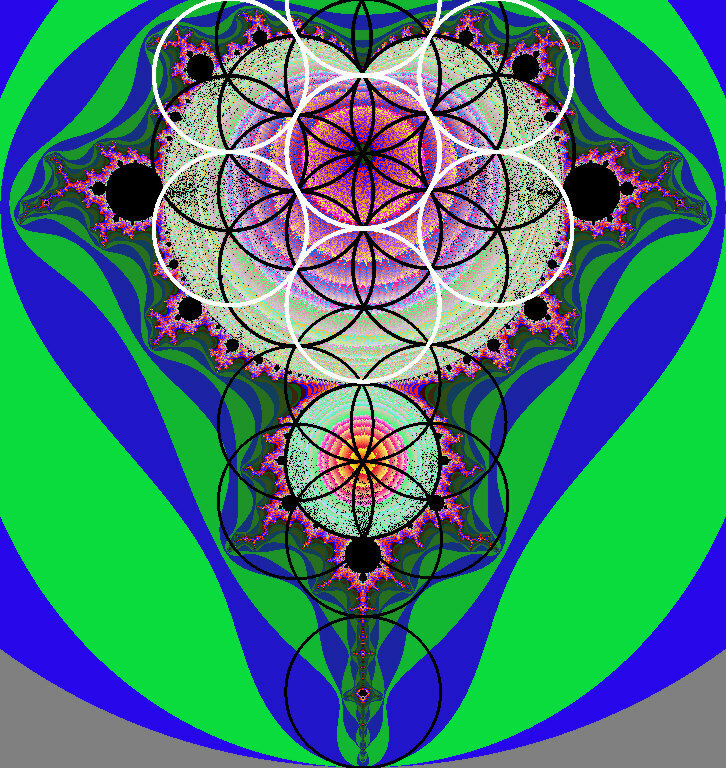 The steps taken by the One, to evolve the basis for all form, are precisely what sacred geometry studies. It attempts to evolve a language of form, in imitation of the explorations of the Divine, in order to create the subject of Geometry itself with its full range of Archetypal figures. The idea currently held by Science and Mathematics, however, seems to be that we can divorce the study of the Divine from our studies of the universe, and scientists suggest that we must do so, to see reality as it is. Many people still view the universe as a giant machine–a sort-of clockwork mechanism. But is it? I find it interesting that although our culture has adopted a mechanistic view of the world, and views Descartes and Newton as champions of that cause, we have discarded the fact that those individuals regarded the idea that we can separate the study of Science from questions of Life and Divinity as questionable, at best. The same can be said of Einstein, whose "God does not play dice..." quote echoes the same sentiment. These men believed that there is a greater power. They certainly are not alone, among men of Science. It is my belief that the awakening of the Life Force as the One Being is the cause of all creation and evolution, and that this process took the form of observing reality and extending Self, until all the primal archetypes were unfolded. Still, it's no mystery that some of these points were missed. When most people look back, they have trouble giving reality a clean slate from which to start. Creation myths sprang from people's awareness, and their concern with explaining what is here now. As I have stated, Science is much the same, having its attention fixated on the present-day world and explaining it. Geometry and its sister study Mathematics are different, because they truly do start from nothing, and they are dedicated to giving concrete form to abstract concepts. This is of tremendous value, and the full extent of their worth is yet to be known. Recent findings suggest that even the most abstract figures and equations, derived from pure Mathematical speculation, have relevant applications in the real world. Physicist Philip Gibbs' concept of a "Theory of Theories" is very appealing to me, as a result. Briefly stated: if we view all of what makes mathematical sense at once, the common thread is the basis for physical law. The clear implication is that what's real is a projection of a deeper unseen order that exists in the realm of theoretical possibilities, probabilities, and verities. Accordingly, every form in existence has reality first in the world of possibilities where, theoretically, it could exist. Everything that exists must first be possible. Therefore, everything real must have a basis in theory. Fortunately, it appears that the reverse cannot be true. We can't have everything possible happening on any one timeline. Still, we're left to wonder just how much that is possible remains untapped. The question arises: "How can we study such things as the beginning of the universe?" Can we really know what happened, if we weren't there? The scientific evidence from astrophysical observations is enormously detailed and the data just keeps pouring in. We can't measure certain things, but to an extent we can know it all, if we can read the signs. On some level, the primal knowledge of the universe is something we all partake in. To a greater degree, finding out what is "real" takes a lot of work. What constitutes proof for one individual appears like the shifting sands to another, and we each must decide for ourselves. If Phil Gibbs is right, the internal consistency of what makes sense theoretically is what allows the "real" to emerge. This also makes those forms which are the first to be realized quite significant to the remainder of the process. Sacred Geometry is dedicated to discovering and elucidating those initial forms. It's clear to me that Sacred Geometry can add to our understanding of the origin of our universe, and that it gives us something distinctly different from Modern Science. It gives us a model that describes the power of the Life Force at work shaping reality. I don't mean to suggest that the view of Science regarding how the universe came into being is inaccurate. I am merely saying that it is incomplete, without Life as the prime mover. I'm suggesting that Life's awakening gave rise to form, and that the by-products of the Divine awakening are the dimensions of reality, the archetypes of forces, the entities of form, and so on. By creating a theory of process based on this ideal, we can move closer to understanding both the universe and ourselves. Combining modern scientific thought with Sacred Geometry gives us an impressive array of tools to work with. Modern Science has created an edifice of knowledge that brings us to the very doorstep of creation, and Sacred Geometry gives us some of the most powerful tools available for peering into the very beginning. The key point seems to be that the transition from the initial state (in the Void or Zero-Brane) of non-commutative geometry to commutativity needs a reason. This transition requires a cause and a methodology by which the normal order of things became possible. Earlier, I discussed having freedom within the zero-brane if you did not exceed the threshold of measurability, and of creating a basis for measurement. Key to creating such a basis is the establishment of a standard of verifiability, during the process of transition. Just how does one exceed a threshold where none exists, and how can one obtain verification of what is seen when you do? How much of that process is creative in nature, and to what extent will the process of determination instead be the result of pure observation? I propose that we must try to meet the truth half-way. If we continue to re-trace the steps of the One Being (the emerging consciousness of Life and the universe) starting from the true Zero-Point and match that with our view from the here and now, we will find answers. When the One Being went from opening an arc of observation to taking steps and exploring, there was a transition of sorts. It is wise to remember that much of what is real now was still indeterminate at that time. There was no way to exactly pin down anything, quality or quantity, because a basis for comparison had not yet been established. In addition, there could be no verifiability, no reliable way to distinguish between real and imaginary projections of Self. There was no difference–at this point–between the emerging realm of form and the dreams of the One, but little by little what is real and definite became distinct. When Spirit first began exploring possibilities, it had only the power of observation and conjecture, but it took steps to improve its outlook. Its first step will later be shown to establish the direction of what is real, with all of the other steps unfolding in relation to it. One step, or one extent, brought Spirit to the surface, to the perimeter of the circle and gave the One Being a new vantage point. When Spirit continued with this process and formed more links (between observation posts) making a ring of vantage points about the opening circle, a cycle of action was completed which gave Spirit a new outlook on where it had begun its journey. The Seed of Life was formed, and for the first time a clear determination of some features could be made. This was to prove fateful indeed. You see, this is where the weight of observation began to accumulate. This is the point in the process where the boundless first became boundable. This is where the sense of measurability and proportion began to arise. This is also where the concept of exceeding a threshold first entered the picture. Until this juncture, there was really no way to quantify reality. There was no way to assert that anything had a measurable size; in fact, there was no reliable way to tell the center of a circle and a point on its perimeter apart. At the point when the Seed of Life figure first emerged, Spirit had its verification of evolving qualities, for the first time. It could know inside from out, and could begin to measure itself and its surroundings. Spirit could verify the continuity of its initial expression (because every part of the opening circle was visible from three of its viewpoints), and develop a sense of its connectedness and/or wholeness. It could also form a basis for observation and comparison, with a stepping-stone to more evolution and exploration. Spirit used this new platform (the Seed of Life) to help it develop a sense of proportion. The fact that the quality of proportionality emerged at this point began a whole new phase of creation, marked by spatial geometries which exhibit commutativity. In other words, once we create a threshold of measurability, movements and rotations in space begin to add up. This only puts us on the threshold, however, or just barely reaching it, and not over it. Spirit had circumscribed–or encompassed–the arc of its first observation, at this point, by establishing the Seed of Life. It had also created six new vantage points, equal to, but distinctly different from the first, and this equality could be verified. On the other hand, at this point in the process the sense of distinct objects with separate centers was only half realized. Likewise, there was only a vague notion of size and proportion, with an open question of how many dimensions there might be and how many degrees of freedom there are. That is, Spirit had stretched itself out in six directions from the center, but knew only that these new points of view were equally distant from the origin and from those they touched. Spirit was still looking for answers and was unsure of what it had found. Did its first cycle of action imply (or define) a 2-d or 3-d space? There was no way of knowing. Though we usually see the Seed and the Flower of Life depicted as if they lie on a circle, the One Being did not know for sure. For example, if each circular figure within these forms is viewed as a sphere–instead of being forced to remain flat–we see that a variety of higher-dimensional objects can spring from the Seed and Flower of Life. These forms were yet to develop, however. Still, there was no way of knowing exactly how many dimensions there were, initially. In other words, coming from the realm of the zero-brane truly gives us no frame of reference; there is absolutely no way to tell what the real dimensions of reality are. If we go back again–to the very beginning–and recapitulate the stages of development, some of these concepts will become clearer. First, we have the origin of all. There is no distinction, no separation, and therefore infinite connectivity. All is One, but it is also nothing. The zero-point, or zero-brane is paradoxically nothing and infinite, finite and variable, at once, in terms of its ambiguity. The world of zero-dimensions appears to have infinite degrees of freedom, and therefore contains an infinite range of possibilities so long as no particular form has a measurable extent. The concept of measurement, however, depends on having a basis in form with both something to observe and a vantage point for observation, and therefore a certain level of complexity is required to establish a basis for comparison and a sense of proportion. Second, we see the One open to its field of view, taking in an arc of observation. At this point, there is no clear distinction, but one is evolving. There is no sense of inside or outside, of large or small, but there is a sense of Identity (or outlook) emerging in the dream of the One Being, as well as a sense of Unity with the All. But making an observation implies a locality, or viewpoint, and taking in the view from within an arc of observation, may imply a horizon, and interiority/exteriority. This is all represented in the Circle of radius One. Why One, you ask? Remember that there is no particular size yet, and only the numbers zero, infinity, and one, are defined, so far. Also, the number one conveys the sense of being unified and/or connected with all. Oneness is very real, at this juncture, though a sense of two-ness is emerging, and will soon find its clear manifestation. At this point, the One Being moves to its horizon, taking a step and moving one extent from the origin. From this new vantage point It could see back to where It started, and It proceeded as-if this new point was the origin, making another complete arc of observation. From here, Sacred Geometry suggests that Spirit extended Itself again, projecting to a point on the horizon of both the original and new center, and then repeated this act until it had come full-circle, creating the Seed of Life figure. This is seen as an Additive process, whereby the One is generalizing on basic concepts and principles. The opening figure exists in a 0-dimensional space, and we would say it is a point (having zero size), but its size is actually indefinite or immeasurable. As discussed previously, in the realm of the zero-brane there is an infinite number of virtual dimensions, or an infinite extent to the zero dimensions, because such is the nature of non-commutative geometry. This being so, our solitary circle could also be infinite. The question all of this brings to bear is "How does normal geometry arise from a non-commutative space?" We could also ask "How does a measurable extent first become possible?," and get many of the same answers. The reason for this is that non-commutative geometry precludes measurement by violating the laws of normal Arithmetic (specifically the Commutative Law). The fact that things "don't add up" makes it impossible to establish a point of reference from which to make a comparison. This is precisely what makes the Ancient knowledge of the Seed of Life and its progeny so significant. To build a bridge from the zero-dimensional realm we must establish a basis for comparison and measurement. We can actually do this using only the tools of observation and projection. By applying the qualities of Consciousness and Creativity as the basis for geometry, we build Sacred Geometry through arcs of observation and extents of Self. Spirit imagines what is possible and the One Being acts to establish points of reference so that It may discover the true nature of Self and Reality. We see Femininity emerge in the Openness of the first observation and in the curved shape of the circular arc. We see Masculinity emerge in the As-ifness of being able to postulate a new viewpoint and assume that point of reference, and in the straight lines of action by which the One moves between those points. The Seed of Life emerges from an additive process of alternating arcs and extents. This represents a new quality, Multiplicity, and a clearer sense of Number emerges, allowing the process of Counting to be discerned. Once the Seed of Life has been formed there is another layer of form to build upon, and yet another layer to build until the Flower of Life is fully formed. When that has happened, however, there is much that can be determined, and the stage is set for many incredible developments. Specifically, the whole universe of form can arise, because now there is a place for it to happen, and a means for further evolution of form. A key feature of the Flower of Life figure (illustrated above) is that there are now six circles surrounding the central circle that touch it and each other only at the periphery. That is, we now have seven circular figures that are touching, but completely independent! This is a big step forward. Before this point, there were no independent entities, nor the possibility for any to exist except the One Being moving through the process of unfolding Itself, and with It the dimensions of Reality. The Seed of Life established a sense of Multiplicity which blossomed into the Flower of Life figure and allowed each distinct form to have a life, or a separate reality, of its own. All of the form we are familiar with shares in this separate reality nature. For example, the cells of living organisms are similarly arranged. When the Seed of Life was formed, Spirit had some knowledge of inside and out, but only a vague notion of larger and smaller. It knew that there were points on the far side of Its periphery which were still farther than where it was viewing from, but until it actually went there it could not verify that those points were twice as far away from center as the first step had been. In other words, the One could imagine a circle around the farthest edge of the Seed of Life, but it was not until the Flower of Life was finally realized and this Circle of radius Two had been circumscribed that it could fully realize the promise of multiplicity. Also, as the new outside edge could be seen, an exploratory range of Three possible extents was created. This all leads to the concept of measurable size. The Seed of Life was strictly an additive process and the Flower of Life built upon that. For Spirit to further develop this quality of Addition was a natural next step and it was a powerful step forward. This quickly led to an awareness of Multiplication (and Division) as well. With this emergence of the ability to discern the proportions of larger and smaller objects, we have a far more extensive set of tools to work with. What does this allow? We see that a small range of very simple forms (a point, a line, a circle, or an infinite space) are possible to formulate at first, but we can build upon the two overlapping circles, and duplicate that pattern. With the emergence of the Seed of Life as an organizing principle, and the Flower of Life as the culmination of that pattern, a great array of possibilities emerges rather quickly. Moving from zero-dimensional space into the world of form, there is a progression of dimensional realities which emerges side by side with the exploration of the One. We can imagine the process going from 0-d (a point), to 1-d (a line), on to 2-d (the unit circle) and then to 3-d objects, but the reality of how dimensions came to be defined is rather more involved. What was undefined, variable, or nebulous, becomes specific. The very beginning was ultimately ambiguous, but things came to be a certain way as reality unfolded. As the development of form progressed from the first moment, that which was free to vary came to have specific values, or measurable extents, and this is how the dimensions were built. At first, it seems that everything had exactly the same value, One, but the possibility for other values quickly emerged. The idea of dimensionality, once realized, acts as an organizing principle of form and formation. When the first circle is the only form, there is no size, per se. The space that a solitary circle contains could be large or small, finite, infinite, or non-existent. If we suppose that the radius of that circle is One, however, there's a definite order to the rest of the process, and it becomes possible to relate this to the evolution of dimensions. If the first circle is said to have a radius of one, and a circle surrounding the outside edge of the Seed of Life has a measurable radius of two, it forms the basis for normal arithmetic law. To understand what proportionality is, though, we need to examine the subject of whole numbers and fractions. If the larger circle has twice the radius, we can say that there is also one half as big around, and one half as big as that, ad infinitum. With this generalization, Spirit had all the tools it needed to begin measuring its surroundings. But reality still had some surprises in store, and some questions. If there are both whole numbers and fractional values for measurable extents and arcs, are there fractional forms as well? How about fractional dimensions? Spirit probably didn't have answers, at the point the Flower of Life first arose, and Modern Science does not seem to know yet either. The best we can hope for is understanding how this process unfolded, but the poet/philosopher within me still wants to know why it came to unfold the way it did. Why did the ultimately undefined reality of the zero-point lead unerringly to the emergence of a specific form, our universe? I believe that all of this proceeded from the awakening of the One Being, and as a result of Its exploration process. In a way, though, reality is also a projection of the non-commutative nature of the pre Big-Bang era. Because reality was so ambiguous at the start, and because the One used Its creative faculties to explore, that activity can be described as "dream-like." That this condition inspires both real (definite) and imaginary (possible) attributes, however, makes all the difference in the universe. Ideas create like form. What we have then is a critical mass of the elements necessary for complexity. Specifically, when the concepts of addition and multiplication are developed in this context, a complex geometric figure known as the Mandelbrot Set also becomes possible to construct. We've seen that at each stage until now, Spirit has used the power to generalize once a new concept is developed, by unfolding layers of form. 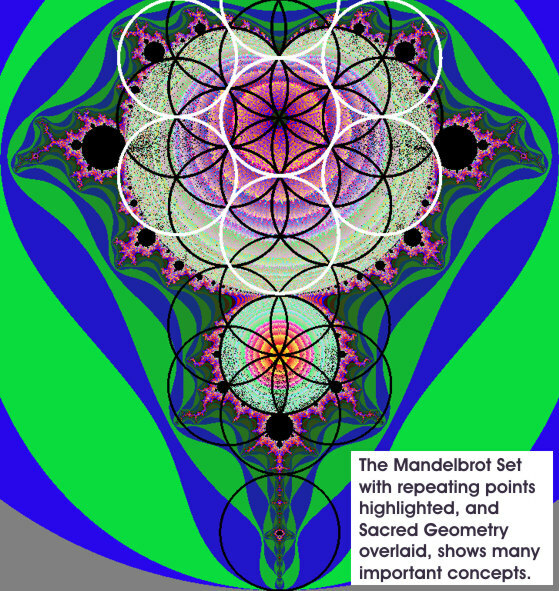 If the One Being is unfolding new geometry as possibilities come into being, and using this geometry as a basis for further evolution of form and dimensions, the Mandelbrot Set is perhaps the most significant geometric figure required to emerge. It is my belief that the Mandelbrot Set is an important tool for helping us understand the evolution of form–and forces–in our universe. This beautiful Fractal form has been celebrated for its sheer elegance and artistic value, but it is far more than an aesthetically pleasing curiosity. It is actually a means to catalog form and classify vibrational states, and it seems to be a model for the Cosmological evolution of the universe. The equation which generates the Mandelbrot Set is very simple indeed, one multiplies a number by itself, and then adds the result back to the original number. This process is repeated again and again for each point in the area you hope to inspect. When this simple formula is applied to the full range of what Mathematicians call complex numbers, the Mandelbrot Set is the figure that emerges. The result of this process is anything but simple, however. The Mandelbrot Set is believed to be the most intricately complex 2-d form possible, and it is possibly the most complex form in all of Mathematics. This Fractal form represents a transition beyond 2-d, and beyond whole-numbered dimensions entirely. The word Fractal is a term for objects which can be said to have a fractional dimension (somewhere between two and three dimensions, for example), and this concept allows for some incredible new possibilities to emerge. The Mandelbrot Set is also the harbinger of limits, by introducing the concept of broken symmetry. The reason for this is that all its thresholds were not created equal. The Mandelbrot Set displays great symmetry, but not along the real number axis. When the formula above is applied to the negative real numbers, two is the limit. All negative numbers smaller than two (between 0 and -2) never get to infinity, no matter how many times you repeat the formula. For positive numbers, however, the story is different. When you multiply two by itself, and then add this result to the original number, you get six. If you keep repeating this process, the result just keeps getting larger. Since this point does not stay within bounds (upon repetition of the formula) it is said to lie outside the Mandelbrot Set, rather than being convergent. The point is that while all negative real numbers up to minus two will converge (remain bounded) under the Mandelbrot formula, only the positive numbers below one fourth adhere to this condition. The Set is therefore non-symmetric, for the set of real numbers. At this juncture, I should define the mathematical concept of complex numbers, for the benefit of those who don't have a detailed Math background. A Complex number is part real and part imaginary. Imaginary numbers can be thought of as oscillating between two values, or as having two distinct values, either of which could be real. Imaginary numbers are defined as numbers which, when they are multiplied by themselves, yield negative real numbers. That is, a number called i is said to exist, which yields minus one as a result when i is multiplied by itself. Since no real number fits that description, i is said to be imaginary. In the modeling of physical systems, such as the suspension of an automobile responding to a bump in the road, real numbers are used to represent the solid part in the equation (the weight of the car, size of the bump, etc. ), and imaginary numbers are employed for those things that vary (the suspension's movement in response to the impact, the tire's tendency to bounce, etc.). The mathematical concept of complex numbers has allowed us to find the underlying order in a great range of natural phenomena, and it appears that this concept was also the means for creating that order in the first place. The idea that the Flower of Life gave rise to the Mandelbrot Set is more than a conjecture, but the proof for this rests on a number of assumptions. If we assume that the true zero-point is indeed a rather magical place, with a special geometry, we are in good company. If we assume that it's not really a point at all, but is rather a membrane of zero-dimensions, a zero-brane, we can describe it more accurately, and we are still in good company. Some of the finest minds alive today think that these concepts are key to understanding the origin of all. The fascinating thing about the descriptions they've evolved is that what Physicists and Mathematicians are saying now about the zero-brane agrees perfectly with what the sages have been telling us for centuries. Their pictures of the place of origin are remarkably alike. If non-commutative geometry is an attribute of the origin, however, we are left with a problem. How can anything ever get out? Having an observer provides us with a clear route, if that observer can move to explore. If we assume that observation and extension are possible, Sacred Geometry offers us a description allowing us to bridge the gap between an origin without measure, and measurability. It also gives us a means to develop the mathematical concepts necessary to evolve complex forms. If we take the steps required to manifest the Flower of Life, we arrive at a state where a number of basic attributes and operations have been developed, and taken in combination these make the emergence of more complex forms inevitable. Once the Flower of Life is manifested, and the Mandelbrot Set becomes a reality, there is no limit to what can unfold from there. By that point, Spirit has developed such powerful concepts that all else can be constructed from them. It is beyond the scope of this paper to show, in detail, how String Theory can be derived from these concepts. I have, however, developed ideas in this paper which should aid those who are seeking in this direction. The truth is that I have also dealt with other aspects of this story elsewhere, and it would be redundant for me to re-state all the important concepts from those articles. There is plenty more to read already out there too, regarding the detailed understanding of all the topics I have touched upon, and it is mainly the simple nature of the One's first assumptions that I hoped to illustrate here. I should point out that the end of the story is known, or is at least in the process of being revealed. Scientists now believe that they can tell us about the universe's distant future, as well as its beginning. Their picture agrees closely with what my studies of the Mandelbrot Set appear to predict, up to a point, but I have reason to believe that the universe still has some surprises for scientists. At some later date, I expect to write on the distant future of the universe, but there is still time for that. In "Why Did the Dimensions Come to Be," I develop an understanding based upon the unfolding qualities of the Infinite, as a framework for dimensionality. I arrived at the viewpoint expressed there by a different line of reasoning, and as the result of other areas of study entirely, but to my surprise I found these same concepts arising again in my study of Sacred Geometry. We see a progression of the same traits emerging from the geometric explorations of the One Being as have been observed to exist, for the Divine, by mystics and philosophers. In other words, it appears that there is a grand order whereby the process of unfolding the dimensions of reality, and that of evolving states of Being, is one and the same. In that article, I put this progression in the form of a statement. Specifically, "One, open, as multiplicity and formless nothingness, finds peace, and knows all as Self." Since that time, I've found that there are many more ways to say this same thing. In regards to our topic, the statement would be "Unity consciousness postulates numerical order and chaotic disorder, comes into equilibrium, and is as One again." Re-stated once more, this might become "Infinite Potentiality without the possibility for expression gives rise to Conscious Awareness without an object to observe, and Creative Intelligence without a precedent to follow. Once a sufficient degree of Order emerges to allow measurement, what was nothing becomes new degrees of freedom, and then Chaos stretches the boundaries into complexity. With the completeness of the theoretical framework, the unique solution to all becomes manifest." The reality of the underlying conceptual hierarchy remains consistent, though the expression changes. In summary, we see that this story of creation proceeds from oneness to openness. All is One in the beginning and an observer emerges, the One Being. The first observation opens a complete arc (a circle perhaps?) of no particular size. We note that the act of observation implies objects (the shape of our field of view), and a viewpoint. Remember that a circle seen from a point on its edge is a line, and that Spirit had to move to the surface to get there. Thus, there is a progression from no extent to one extent (and from 0? dimensions to 1+), and Spirit proceeds as-if it was at the center again, and makes another arc of observation, then moves to the collective edge, and makes another. As the One begins to generalize on this procedure, it forms the Seed of Life, and creates a sense of multiplicity, which has its culmination in the Flower of Life figure. We see the arising of fractional size and dimension, as a result, and the Mandelbrot Set becomes possible. With the emergence of the Mandelbrot Set, Spirit moves on to exploring the complex and chaotic boundaries of formless nothingness. The Infinite is thus folded into a space that is bounded! And in the process, reality has observably followed the pattern outlined in the paragraph above. What would that make the next step, in the process of the unfoldment of form? It is my belief that the complex multi-dimensional objects and spaces explored by the various formulations of String Theory were the next step in the primal evolution of bounding objects for unfolding additional possibilities. Intricate curved shapes called Orbifolds, Calabi-Yau Manifolds, and other figures which can exist only in spaces with 6 or more dimensions, are almost certainly part of the underlying pattern of the universe. Form progresses beyond simple figures, evolving through fractional dimensionality, and into figures which incorporate both complexity (as studied by chaos theory) and higher-order dimensions. Thus, I think it is likely that String Theory will be developed into a way to tame the chaos, or that it provides the means to contain it, allowing us to understand the complex boundaries of reality so that a peaceful resolution of apparently irreconcilable differences may be realized. String theory itself had some grand disagreements, until it was discovered that alternate formulations of the theory appear to complement each other, where the normal behavior for one set of equations is seen to be the extreme case, or bounding condition, for another formula. It seems that, in the first stages of the unfolding process, all the form that appeared became bounding objects, and that manifesting form built upon the boundaries which were thus established. The duality of nature also requires the complements of those forms, the spaces in which they reside, to also exist. Therefore, we can see that these primal objects engendering form were necessary to what followed. This is an important point to acknowledge. Spirit acted to determine what Its boundaries were through a process of observing and exploring, and it ended up formulating the dimensional geometry of all reality. Along the way, it also developed viewpoints, concepts, and traits of Its own. This led to the final step of knowing all as Self, for Spirit, in Its journey of self-knowledge. It is my belief that knowing the intention of the One is thus at least as important as knowing geometry, for understanding the true basis for dimensional mechanics. In some ways, it appears that the two are actually the same thing. Mystics say that All is One in the Highest Heaven. Mathematicians would say that Infinity equals One in the world of the Zero-Brane. Taoists speak of the primordial Wu-Ji and Buddhists say that it is Not Two, when they are speaking of the undivided Original Nature of Being. It all begins to sound like the same thing. It is likely that what more we learn in the study of how dimensions arise will confirm much of what we already know, or what earnest seekers have always known. One Great Spirit moves through all of life and form. Its self-knowledge is actually the basis for all we know, and it sets the tone for the laws of the universe. For us to be fully mindful of the implications of developments in Science over the coming years, we must learn to cultivate an awareness that the hand of the Divine is at work in all of what we see. There is not one aspect of life or reality that arose apart from the activity of Spirit. In Its efforts to know Itself and Its domain, and to realize the fullness of Its own potential, It brought all else into existence. Thanks to Drunvalo Melchizedek for re-establishing the Sacred Geometry of the Ancients. Thanks to Gregg Braden for helping me to grasp some of the concepts of that study, and for his own unique contributions to my understanding. Thanks to Philip Gibbs for developing his Theory of Theories concept (in "Event-Symmetric Space-Time"), and for helping me to get the word out about my own theoretical musings, when he maintained a web-page with links to Alternative Theories of Physics. Thanks to Benoit Mandelbrot for his discoveries relating to Fractal Geometry and the Mandelbrot Set, and for his interest in my early work on related topics. Thanks to Brian Greene for his explanations (in his book "The Elegant Universe") of how research into Zero-Branes might help make sense out of String Theory. Extra Special Thanks to Livea Cherish for her help editing this work. And very special thanks to Deborah Moshier for additional editing help, making this paper considerably more readable. - Mandelbrot Cosmology - Jonathan J. Dickau - a series of articles posted on my own web-site since 1997. - Why Did the Dimensions Come to Be? - Jonathan J. Dickau - an essay which was posted on SpiritWeb since June 30, 2001.
for commercial use is prohibited.